CEDAR CITY – An Enoch police officer who was struck in the head with a baseball bat while responding to a domestic violence call is doing OK Tuesday after a late night hospital visit where he was treated for head injuries. With the Health Insurance Portability and Accountability Act firmly in place, Enoch City Police Chief Jackson Ames said he is reluctant to discuss the particulars of his officer’s injuries, but wants the public to know that the officer is safe and resting at home. Though he did not lose consciousness, the officer was transported to Valley View Medical Center, Ames said, where he was treated for head injuries and released within a few hours. For now, the injured officer is on leave to give him time to heal, Ames said, and his shifts have been covered. While police officers never know what situation they may be walking into when they respond to a call, Ames said, usually, they are able to talk to the person until they calm down. “It can be crazy one minute and calm the next,” he said. The incident occurred Monday night after the officer responded to a call that came in at 9:17 p.m. about a domestic fight in progress, according to the Police Department’s press release. 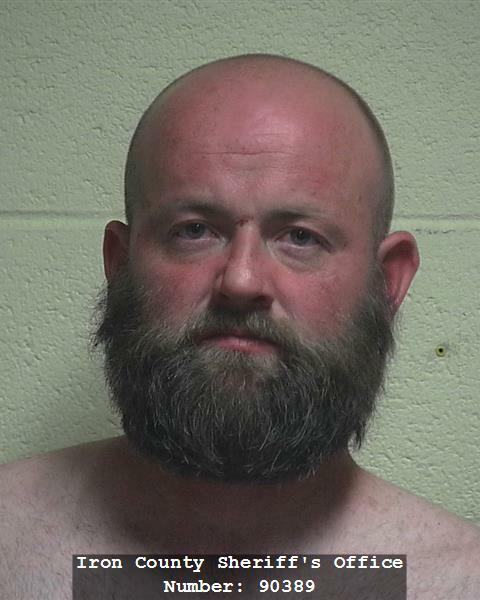 Daniel Merrill Bott, the 37-year-old Enoch resident who allegedly struck the police officer, was taken into custody and booked into Iron County Jail at 12:30 a.m. Tuesday, according to Iron County Bookings. According to the Iron County Bookings Web page, Bott was charged with assault against a peace officer, a second degree felony; domestic violence assault, a class A misdemeanor; resisting arrest, a class B misdemeanor; and three counts of domestic violence in the presence of a child, class B misdemeanors. There is no bail set as of 11:30 Tuesday morning, and Bott was still in custody at the jail. Because the investigation is ongoing, Ames said, he is unable to elaborate on any additional details and referred all inquiries to the Iron County Attorney’s Office. Iron County Attorney Scott Garrett said alcohol may have played a role in Monday night’s incident. As part of protocol with any head injury, Garrett said, the injured officer will have a CAT scan done Tuesday to ensure that everything is OK.
Ames is strongly considering investing in football helmets for his officers to wear on calls like these – just in case, he said with humor, in light of Monday night’s incident. How unprofessional of the Chief to make light of this. The officer hit in the head with the bat could have life long problems due to this. Even if he recovers now he could have issues later in life. Why would you joke about this! Clearly their Chief does not know about brain injuries. Perhaps you misunderstood the tone, Mr. Dunlap. The police chief takes the matter very seriously. I know this because he took exception to our first headline on this story which used the word bonked instead of hit on the head. He felt our choice of word made light of an assault on his officer. We readily deferred to the sensitivity he expressed and revised our headline to say the officer was hit on the head. Point being, he expressed clearly to us how seriously he takes the incident. Brent, I could tell you about “cop humor” but this is probably just Chief Ames’ showing his relief that his officer was only “few hours in the hospital.” It is obvious to me, and most assuredly him, that his officer will not have brain injuries. (After all, they are waiting until the next day for his CAT scan.) Luckily this wasn’t as severe an injury as it certainly could have been. Obviously, you do not know about brain injuries either. Glad this is just a big joke to all of you. The man hit in the head now has an increased chance of lifetime disorders including stroke and memory disorders. Just because he is released from the hospital does not mean his life has not been impacted forever. Aw Brent, you don’t know what I know. I’ve spent months nursing an unconscious friend during his sever brain injury. (He wasn’t released from the hospital within 3 hours.) I’ve seen the damage done by helmet-less motorcycle accidents. I’ve seen sports concussions. While there is a chance that this officer can be effected by compounded concussions (as many athletes can be) it makes no sense to worry now, if the medical staff that examined him are not. We cannot go around wrapped in bubble wrap. And for the record, it’s not “a big joke to us all.” Every assault on an officer is a serious thing. Try to understand the relief most assuredly felt by the police chief that he was able to ease the tension with a bit of harmless humor. Mike, I am glad you know as much as a retired neurologist. Good for you. I am also glad that you find it ok for a chief of police to make jokes about a brain injury, and yes blacking out means the brain was injured, but you know that. I wonder what else the uneducated backwoods police chief jokes about? Brent, good for you, retiring to the backwoods like you have done. If you’d like to file a complaint with the city or the police department, I’m sure you will get someone who will fill out a form for you. Have a nice day. Dangerous people do dangerous things. I’m glad that the cop wasn’t hurt any worse and I’m also surprised at how unbeaten the suspect looks. Usually this situation calls for an “accident” behind the sally doors or in the elevator. If a police officer is attacked with a potentially deadly weapon like a bat, he has every right to shoot at the attacker. Mike, since you know as much as an MD, I was wondering if you could tell me where a hit to the head from a bat falls on the Rancho Los Amigos Scale? Oh Brent. Get over it. Obviously I’m not a retired neurologist. Good for you. (Is arguing with strangers and throwing your knowledge around really how you spend your retirement?) My first point still stands, the police chief was probably just showing his relief (and probably trying to reassure his officers) that the injured officer is “OK.” Try to think like a human being and you might understand what I mean. I’m done with you.